All Honda TRX450 Dasa exhaust systems are handmade here in the USA and the quality really shows with perfect tig welds, trick billet end caps, a billet canister mount, thick head pipe flange and the end caps do unbolt for easy canister repacking. 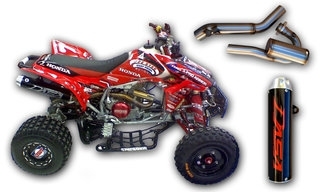 The Honda TRX450 Dasa exhaust system has been proven on the dyno to make big HP throughout the entire power curve. This is a multi-step, stainless steel exhaust system that includes a head pipe, mid pipe, and an exhaust canister. This exhaust system has countless national motocross victories, four stroke wars wins, AMA and ATVA championships. Optional Quiet Core is available for this model and is sold separately (Spark Arrestor Included with Classic Models). Custom color options are available. We offer custom candy blue, candy red, & white canisters. You can also choose from black end caps or the standard raw aluminum end caps. We try to stock as many of these custom color combinations as possible but please be aware that these are custom order and can take up to two weeks to ship (if not in stock).